One of the biggest knocks against the DC Extended Universe has been its general lack of vibrant color compared to the comic books. In exchange for gritty realism, the DCEU—especially its costumes—come across as unsaturated and dour. That’s a shame because, up close, the League’s costumes look great. 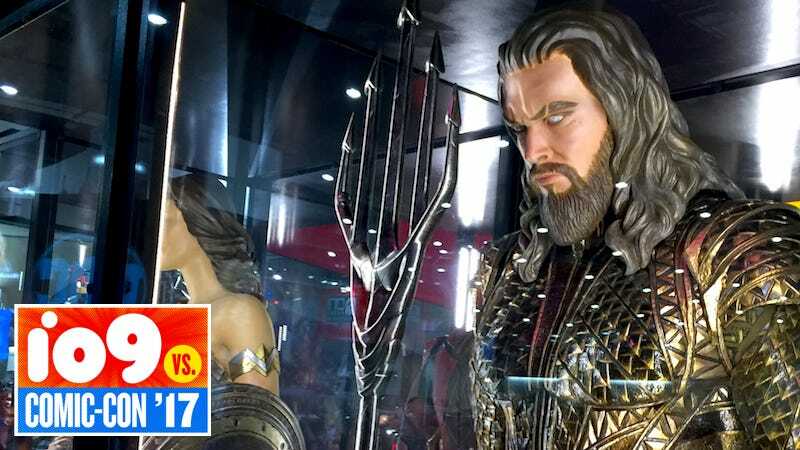 Last night, Warner Bros. and DC unveiled a series of replica costumes from the upcoming Justice League movie that showcased every painstaking detail that went into bringing the characters to life. It’s one thing to see the costumes in motion on a screen in a trailer—you know what you’re looking at even though you’re not taking it all in. But it’s another thing when you actually get a chance to pore over the geometric complexity of Aquaman’s chest armor or the intricate latticework that makes up Cyborg’s abdomen. Note the subtle references to Aquaman’s traditional orange/green outfit that’s been toned down here in favor of a more subtle, gold-heavy aesthetic. The vast majority of Cyborg’s body in the DCEU is composed of metal from a Motherbox that creates a much less human look compared to his comics counterpart and much more akin to Marvel’s Ultron body. Batman will apparently don his desert armor again, here accented with gold details that hearken back to the days when the Bat logo was primarily yellow and black. The Flash’s costume is actually the one worth paying the closest attention to, as it’s less a single piece of armor like most of the other leaguers’ and actually a dense bodysuit plated with disconnected pieces of armor, allowing for maximum flexibility while in motion. The plates are also tethered to one another by a network of flexible fibers. Surprisingly, all of the costumes are much more vibrant than they’ve looked on screen in a way that makes you wish Warner Bros. post-production color grading process were a little less aggressive.These costumes are absolutely gorgeous and when we finally get a chance to see them in theaters all together, we can only hope that Justice League gives them a chance to shine. Hmm, Can You Spot the Differences Between the Justice League Flash and This Life-Size Lego Flash?